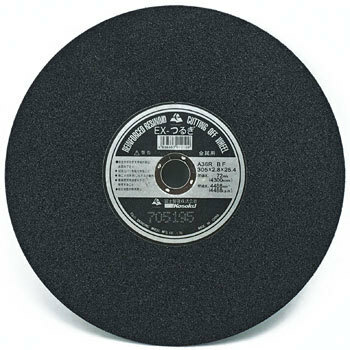 Cutting Wheel, "Hida no Takumi"
Since we are not an ironworks factory, I bought 5 of 355 entries and it has more than 2 years. The price is moderate, I think that sharpness and durability are also good. It is repeat purchase. This review is about item#3351083. Sharpness was good and rice cakes were good, so it was good. This review is about item#03351092. This review is about item#03351074. This time EX sword is purchase with repeat. Because it is cheap, it is convenient to buy it collectively. The feeling of use without problems is very good. I want to purchase again when it runs out. Used for light iron cutting. Durability and price are satisfying rightly. It is used for cutting of single pipe of φ50, but it can cut cleanly in a short time. I am happy that burrs generated when cutting can be chamfered using the side of the grindstone. Since it is a consumable item, several pieces are ordered at a time. This review is about item#41243413. I am well off and cheap, I am saved. It is recommended! This review is about item#37422506. Can be used without problems. I think that the wear resistance is good one. This review is about item#41243431. It is good for price, it is cheap and I appreciate it. Hard iron products such as iron pipes and iron plates etc. Anyway sharpness is sharp and can be cut out preeminently well. I think that those who bought this product will be useful.